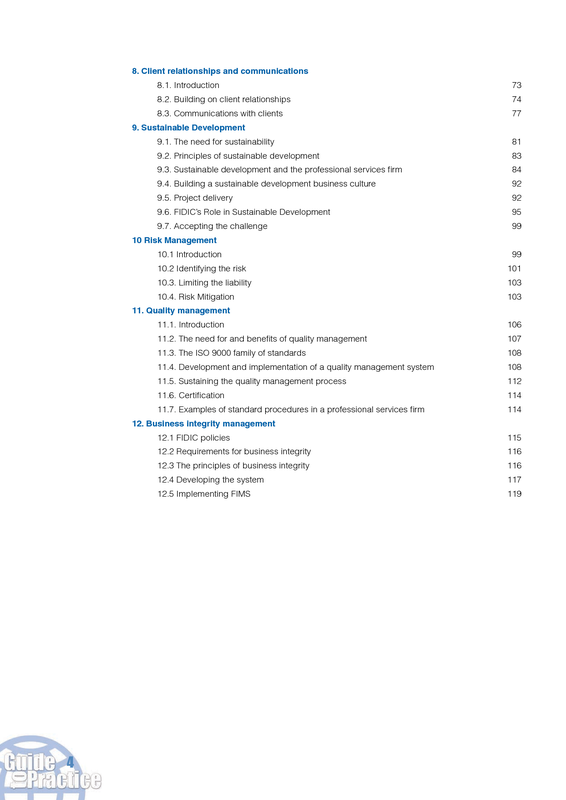 This 2nd edition of the Project Sustainability Management, PSM II, is first and foremost a list of core issues that engineers should consider when carrying out projects in a sustainable way, backed up by a number of processes for the broad inclusion of stakeholder input. Each item on the list brings with it a set of perspectives, which are the sustainability considerations that affect the way these issues should be considered on the project. A good part of this manual consists of descriptions of these perspectives and an indication of possible project responses as well as logical links between the perspectives of different issues. 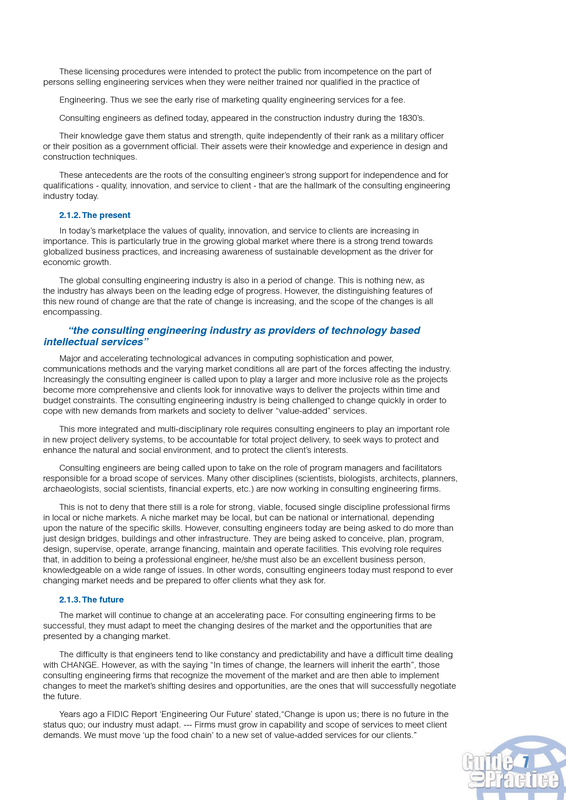 The FIDIC 2015 State of the World Report is the third in a series of State of the World Reports which FIDIC produces as a service to its members, partners and stakeholders, on global issues which professional consulting engineering firms can help the world to address. The world has a serious multi faceted water problem and, without more effort from all stakeholders, - and we are all stakeholders - we will soon be faced with a water crisis. This document addresses a number of water issues and suggests some ways to address them. 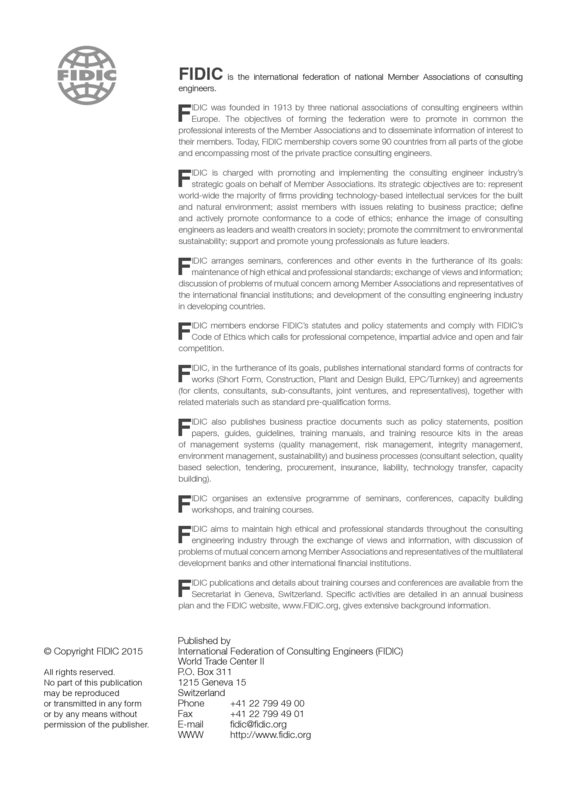 FIDIC Guidelines for the Selection of Consultants, 2nd Edition, 2013. Containining examples of Detailed Task Descriptions and Sample Coordination Checklists. Quality Based Selection (QBS) Guidelines (2011) brochure. Electronic version in PDF. 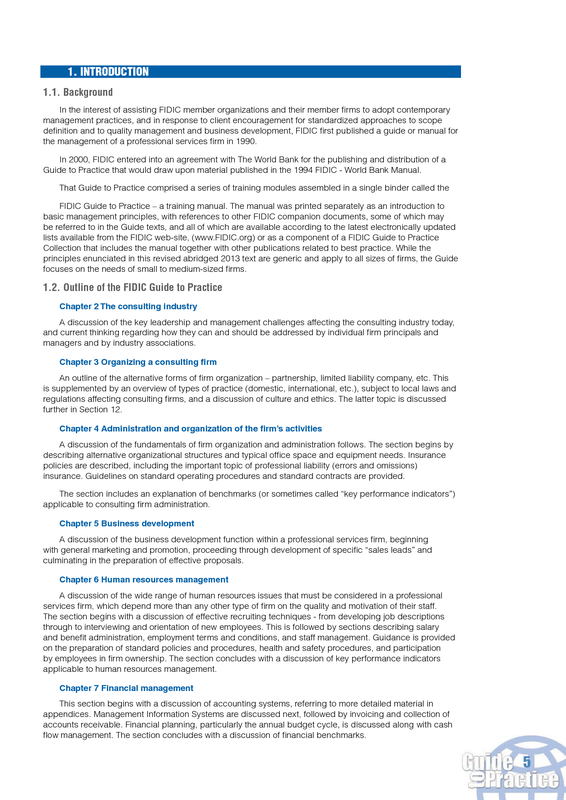 In the interest of assisting FIDIC member organizations and their member firms to adopt contemporary management practices, and in response to client encouragement for standardized approaches to scope definition and to quality management and business development, FIDIC first published a guide or manual for the management of a professional services firm in 1990. 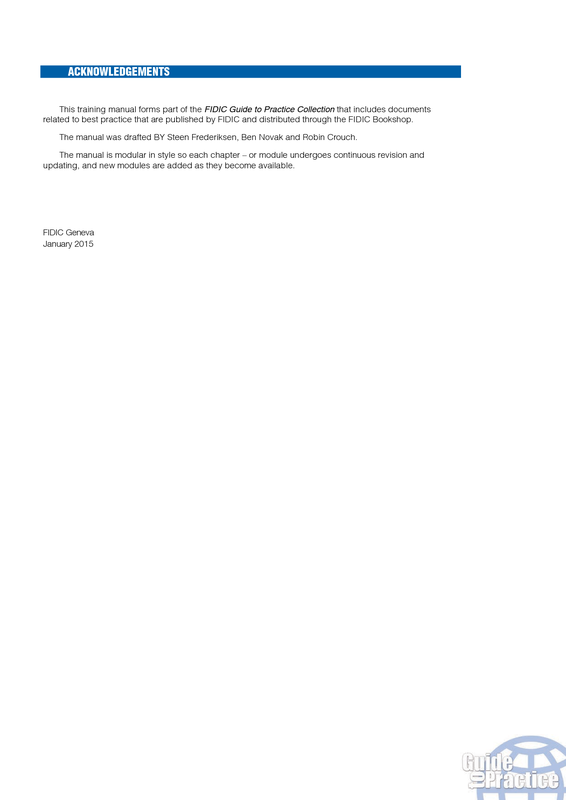 In 2000, FIDIC entered into an agreement with The World Bank for the publishing and distribution of a Guide to Practice that would draw upon material published in the 1994 FIDIC - World Bank Manual. 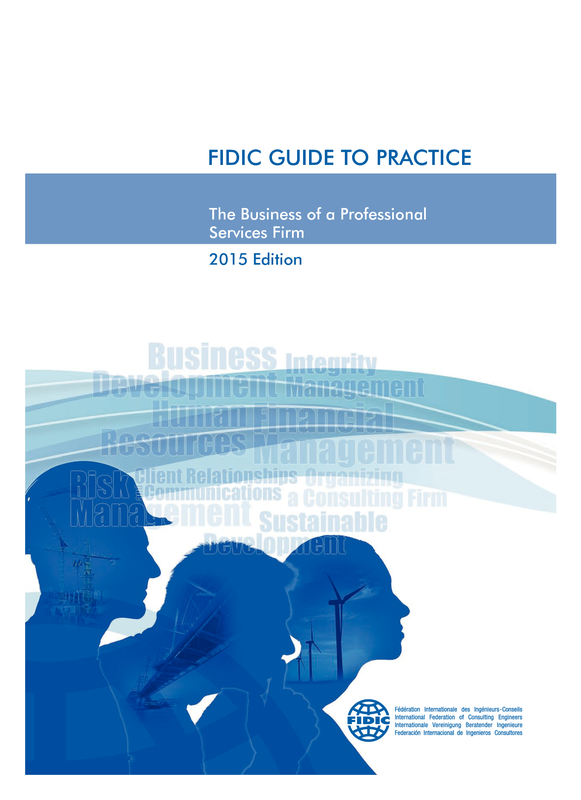 That Guide to Practice comprised a series of training modules assembled in a single binder called the FIDIC Guide to Practice – a training manual. 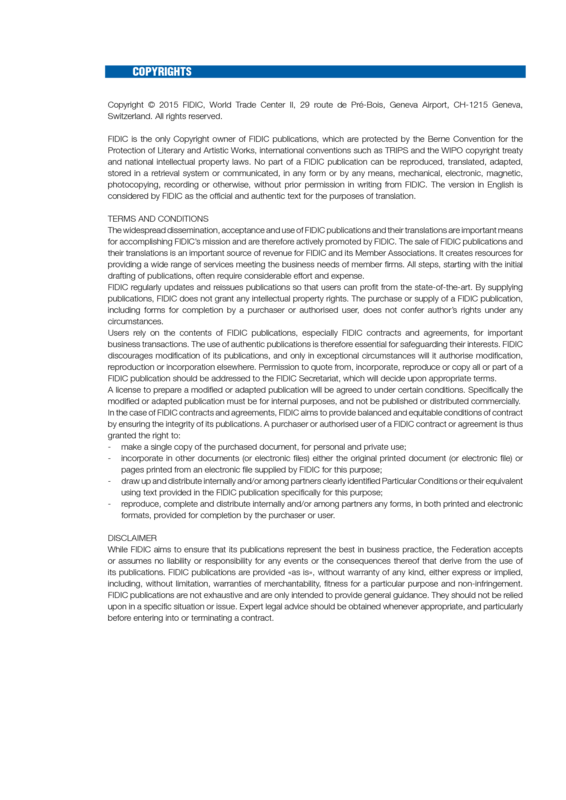 The manual was printed separately as an introduction to basic management principles, with references to other FIDIC companion documents, some of which may be referred to in the Guide texts, and all of which are available according to the latest electronically updated lists available from the FIDIC web-site, (www.FIDIC.org) or as a component of a FIDIC Guide to Practice Collection that includes the manual together with other publications related to best practice. 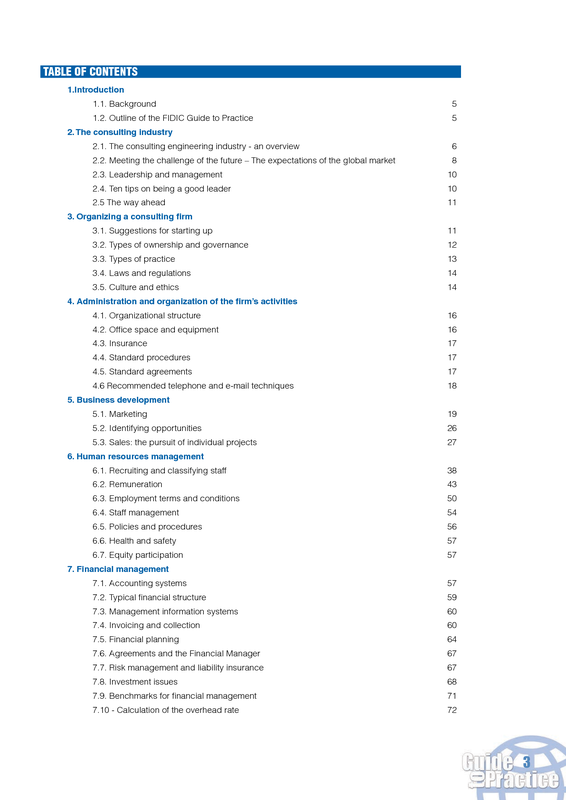 While the principles enunciated in this revised abridged 2013 text are generic and apply to all sizes of firms, the Guide focuses on the needs of small to medium-sized firms. A discussion of the key leadership and management challenges affecting the consulting industry today, and current thinking regarding how they can and should be addressed by individual firm principals and managers and by industry associations. An outline of the alternative forms of firm organization – partnership, limited liability company, etc. This is supplemented by an overview of types of practice (domestic, international, etc. 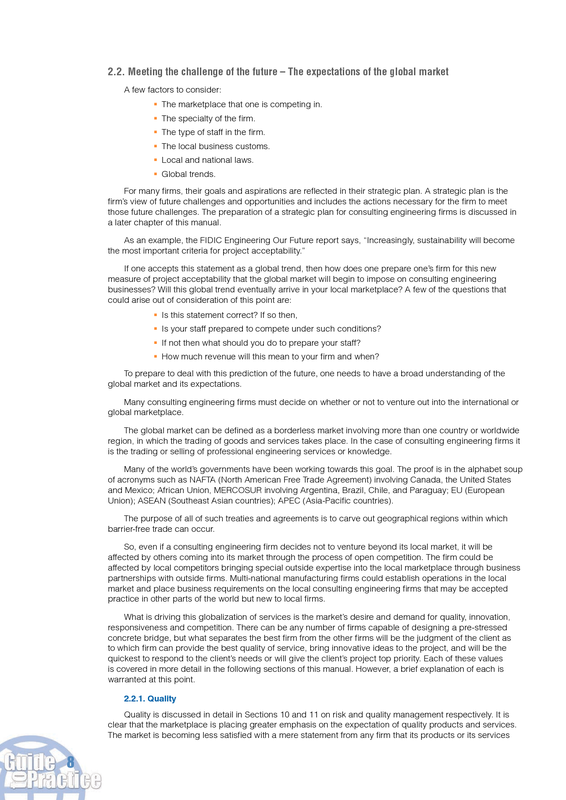 ), subject to local laws and regulations affecting consulting firms, and a discussion of culture and ethics. The latter topic is discussed further in Section 12. A discussion of the fundamentals of firm organization and administration follows. The section begins by describing alternative organizational structures and typical office space and equipment needs. Insurance policies are described, including the important topic of professional liability (errors and omissions) insurance. Guidelines on standard operating procedures and standard contracts are provided. 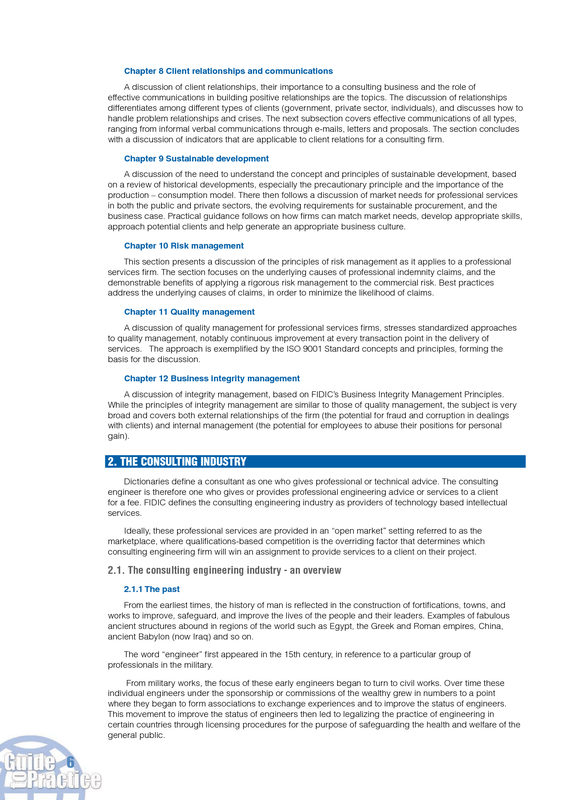 The section includes an explanation of benchmarks (or sometimes called "key performance indicators") applicable to consulting firm administration. A discussion of the business development function within a professional services firm, beginning with general marketing and promotion, proceeding through development of specific "sales leads" and culminating in the preparation of effective proposals. A discussion of the wide range of human resources issues that must be considered in a professional services firm, which depend more than any other type of firm on the quality and motivation of their staff. The section begins with a discussion of effective recruiting techniques - from developing job descriptions through to interviewing and orientation of new employees. This is followed by sections describing salary and benefit administration, employment terms and conditions, and staff management. Guidance is provided on the preparation of standard policies and procedures, health and safety procedures, and participation by employees in firm ownership. The section concludes with a discussion of key performance indicators applicable to human resources management. This section begins with a discussion of accounting systems, referring to more detailed material in appendices. Management Information Systems are discussed next, followed by invoicing and collection of accounts receivable. Financial planning, particularly the annual budget cycle, is discussed along with cash flow management. The section concludes with a discussion of financial benchmarks. A discussion of client relationships, their importance to a consulting business and the role of effective communications in building positive relationships are the topics. The discussion of relationships differentiates among different types of clients (government, private sector, individuals), and discusses how to handle problem relationships and crises. The next subsection covers effective communications of all types, ranging from informal verbal communications through e-mails, letters and proposals. The section concludes with a discussion of indicators that are applicable to client relations for a consulting firm. A discussion of the need to understand the concept and principles of sustainable development, based on a review of historical developments, especially the precautionary principle and the importance of the production – consumption model. There then follows a discussion of market needs for professional services in both the public and private sectors, the evolving requirements for sustainable procurement, and the business case. Practical guidance follows on how firms can match market needs, develop appropriate skills, approach potential clients and help generate an appropriate business culture. This section presents a discussion of the principles of risk management as it applies to a professional services firm. The section focuses on the underlying causes of professional indemnity claims, and the demonstrable benefits of applying a rigorous risk management to the commercial risk. Best practices address the underlying causes of claims, in order to minimize the likelihood of claims. A discussion of quality management for professional services firms, stresses standardized approaches to quality management, notably continuous improvement at every transaction point in the delivery of services. The approach is exemplified by the ISO 9001 Standard concepts and principles, forming the basis for the discussion. A discussion of integrity management, based on FIDIC’s Business Integrity Management Principles. While the principles of integrity management are similar to those of quality management, the subject is very broad and covers both external relationships of the firm (the potential for fraud and corruption in dealings with clients) and internal management (the potential for employees to abuse their positions for personal gain).